We're pleased to announce that Speedy Route subscriptions can now also be purchased via PayPal, in addition to our existing payment methods. Speedy Route has always accepted credit/debit card payments (through our excellent merchant account provider stripe.com), but some of our customers have indicated a preference for PayPal if possible, so we have now added this as an alternative payment method. Clicking 'Check out with PayPal' will open up a new window or tab where you can login to your PayPal account and authorize the payment. 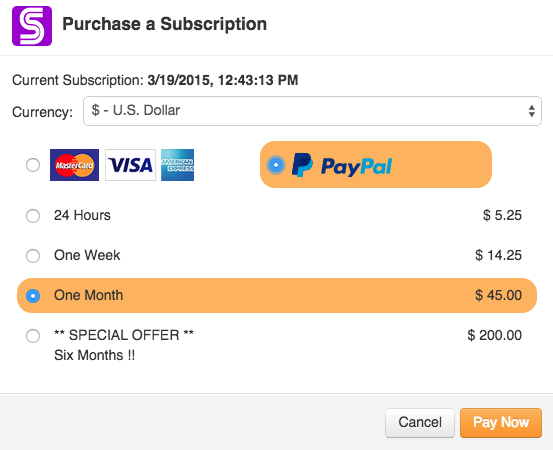 Upon authorization of the payment, you will be returned to Speedy Route and the subscription purchase is completed. Remember that any current valid subscription allows you to make unlimited route calculation requests while the subscription is in effect, and each route can contain up to 500 locations!